Joung Sohn doesn’t get enough credit or exposure for being the executive chef of what might be the highest volume, fine French restaurant in the country. So how did a Korean-American get into this high-pressure world of fine dining? “I think I was a French man in my last life,” she laughs. Born in Korea, she was raised in Chicago and “didn’t have a cheeseburger until I was a teenager.” After graduating from Carlton College and the New England Culinary College, she landed her first job with the great Jean Joho at Everest (in 1994), and has been in his French food fold ever since. 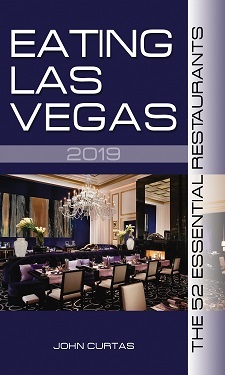 ETR opened in September 1999, and she took over executive chef duties a month later, making her a triple threat among all of Vegas’ female chef executives: the busiest, the longest tenured and the highest off the ground. ELV tried to pay attention to the wisdom of Sohn’s words, but he kept getting distracted by her soups — a cream of French onion that nailed the flavor profile without overwhelming it with cream, and a lobster bisque that was so full of lobsterness, it tasted like the crustacean had jumped off the boat into the bowl. If soups are, as Escoffier said, the true test of a cook, Sohn and her kitchen passed with flying colors. Then there was what might be the best lamb burger on the planet. She told us she wanted to created a lamb burger for people who might be put off by the strong taste of lamb, so she mixes healthy doses of cumin, cayenne, cinnamon and allspice into the meat, and spikes her mayonnaise with harissa paste and serves it all on a perfect burger bun — not too dense but not too soft either. The meal was capped by a berry pudding of direct flavors and simple sophistication. Basically, brioche is soaked in fresh fruit syrup and served with some of the same fresh berries. Luscious, dense and light (no mean feat that), it might be the perfect dessert for a scorching Vegas summer day, and certainly is every bit as pretty as the view out the Eiffel Towers’ windows. will have to try it. I tried the Lamb burger at Holsteins and thought it was terrific. he looks good with it.